The app shall be used by the maintenance personnel to digitize the activity of the maintenance and troubleshooting. The regular maintenance activity and the troubleshooting can be digitalized in the first step, and the subsequent users shall be able to follow those guidelines digitally and easily. In this way, the documents and the workflow for this department shall be changed in a digital way, and hence making the documents accessible easily. Another flavour of the app, has the OEM to make this as a separate app for each model of the machine, and then, they can standardize into a common feature, and give an easy access for their customers. In this way, the end customer can have a facility to decrease the downtime and increase the productivity, hence following Industry 4.0 solutions. The workflow in the app starts such a way, that the user shall be able to pinpoint a specific coordinate in the spatial axis, and put a placard with a digital content, ranging from ordinary text, to videos and images. The placard is then placed and fixed in that particular position. Similarly other placards/ hotspots can be created and placed at that particular position - hence making the maintenance points fixed and stable. The end user shall be able to recognize the code, either a QR-code OR a geometric interface as the recognition point. Based on the recognition point, the user can be able to see all the spatial maintenance points and the digital content via Augmented reality and do the job much similar and faster. 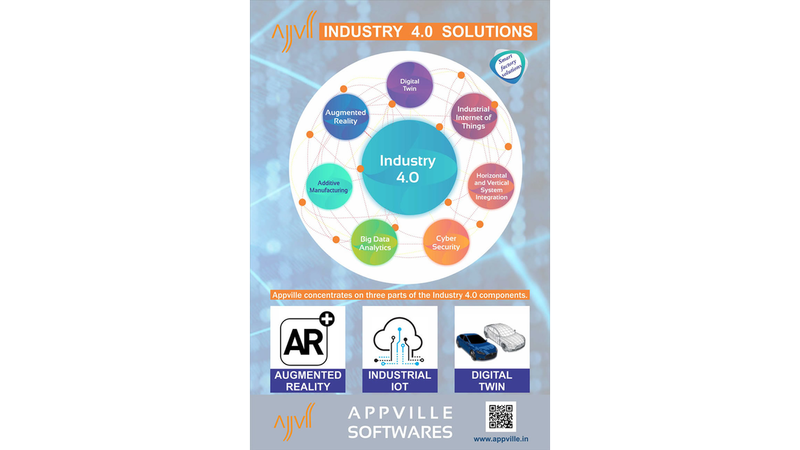 Appville softwares, based in Coimbatore, India is a software driven company - providing solutions related to Industry 4.0, catering specifically to the OEM with respect to Industrial IOT, Augmented reality and Digital Twin.